Newly single mom Maggie (Melissa McCarthy) works long hours and needs somebody to keep an eye on her son Oliver after school. Turns out her cranky neighbor Vincent (Bill Murray) could use the cash, and a bargain is struck. Vincent is the worst possible caregiver, which turns out to be for the very best in this quirky comedy. Of course. 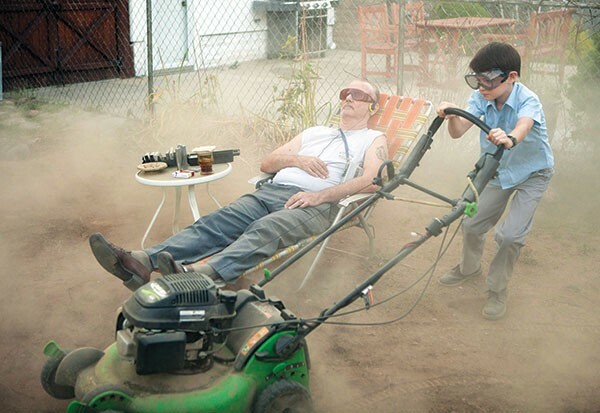 St. Vincent, from writer and director Theodore Melfi, making his feature debut, isn't about plot. It simply sets up a shaggy-dog framework so its star can just be his patented brand of loosely funny in scene after scene of doing banal things. Murray dances to classic rock. Eats sardines. Withdraws money from bank. Drives. I'd have happily watched that for 90 minutes, and even Melfi seems to get it: There's a lengthy scene that is just Murray singing along to Bob Dylan and badly watering a plant. But Hollywood needs a hook, and here it's Oliver (Jaeden Lieberher), the naïve kid who needs to be schooled in debauchery by Vincent, which has the reverse effect of allowing the old curmudgeon to drop his guard and care about somebody. On their shared journey, they hit the racetrack, a dive bar and a tree or two. That's all good. Another genuinely funny performer, Chris O'Dowd, gets the most fun he can out of what is essentially a straight-man role, as a priest and teacher at Oliver's Catholic school; his reaction to Oliver's mom's over-share about her fallopian tubes is some delightful mugging. But throughout the delicately balanced buddy comedy of Vincent and Oliver, Melfi can't stop beating us over the head with the not-so-surprising reveal that cranky old Vincent is a nice guy after all. From the give-away title and the detailed definition of what a saint is from Oliver's teacher to the final reel's clunky enumeration of the same points all over again, Melfi's lack of faith in the viewers' ability to discern the obvious winds up smothering what could have been a far more winning feature. But, you're coming to see Murray, and this is a film clearly constructed for his bittersweet, off-kilter comic gifts, so you won't be totally disappointed. Think of St. Vincent as a perfect bite of sweet-but-tart candy that is unfortunately covered in waxy "chocolate-y coating" instead of creamy chocolate.